eShakti is a company that customizes sizes according to your body. You can choose this option or choose standard sizes. It is not very expensive and sells very cute clothing. I love the great variety of dresses that they sell too. 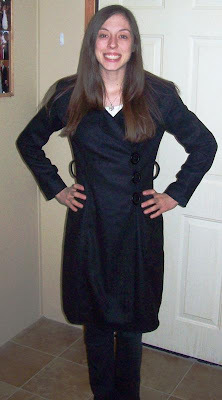 I chose this Asymmetric Collar Felted Pea Coat to review. I have been wanting a new coat since last year and finally found one that I liked. The most amazing part is that the coat actually fits me. Usually, coats are too loose and therefore, not warm enough. It fits me perfectly and the quality is great! This coat retails for $99.95 and ships very quickly. Here is a dress that I love that I almost chose to review! This is a coat that I will be able to wear all through the winter! Thanks eShakti!